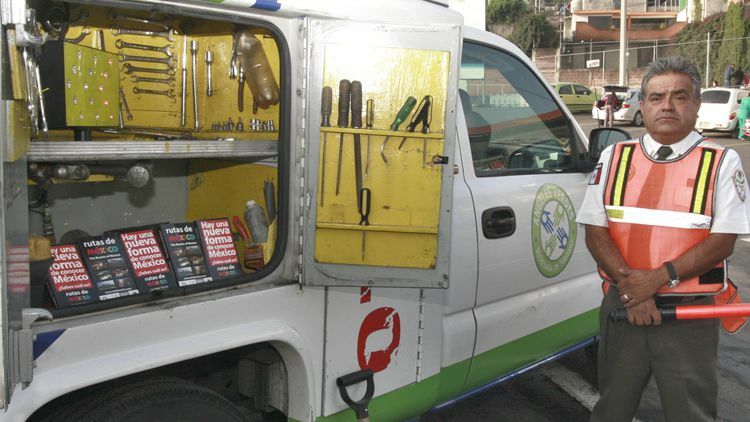 If you're driving in Mexico and encounter problems on the road, the Ángeles Verdes (Green Angels) is a government-funded fleet of mechanics and first aid technicians you can call for assistance free of charge. Whether you're experiencing mechanical issues, get lost without a map, or need medical assistance that doesn't require a hospital, the Green Angels are a good resource for any traveler in Mexico. You can request help from the Green Angels by dialing 078 from any phone in Mexico, and agents will come to your location to assist with car repairs, provide first aid, or offer information about road conditions, tourist attractions, emergency services, and crime assistance. The phone operators are bilingual and can point you to the best action to take or other resources that may be helpful to you. Green Angels patrol all federal and toll highways in Mexico and offer free assistance in the case of a breakdown, accident, or medical emergency. They are knowledgeable about road conditions and can provide basic tourist services. The Green Angels are funded by Mexico's Secretary of Tourism. They have over 300 vehicles that patrol an average of 60,000 kilometers of Mexican highways every day and over 22 million kilometers each year. The Green Angels are trained in auto mechanics and carry tools and spare parts so they can perform emergency or temporary repairs, such as changing tires, dealing with an overheated engine, or replacing a gas pump. They can help you arrange to have your car towed if more extensive repairs are required. Trained in CPR, the Green Angels can administer first aid in the event of an accident or medical emergency. They can also help you contact local hospitals and emergency support services and can perform necessary life-sustaining medical treatment in certain situations until medical support arrives. Additionally, Green Angels can assist you in reporting or seeking shelter from crime. You can contact the Green Angels by dialing 078 from any phone in Mexico. The operator will transfer your call to the dispatch service, who will then communicate via radio with a unit in your area. The 078 phone number is a 24-hour hotline that you can call for telephone assistance at any time. If you don't have access to a phone, just pull over and put your car's hood up. When the Green Angels pass on their regular rounds, they will stop to offer you assistance. The Angeles Verdes service is only in operation from 8 a.m. to 6 p.m. daily, so you will not be able to flag down a car overnight and may have to wait an extended time for dispatch to connect you with a service member. Also keep in mind that the Ángeles Verdes service is only offered on major highways and toll roads, so if you choose to travel on the free roads (carreteras libres), you're on your own. Any service provided by the Green Angels is free of charge, but you will need to pay for any parts, gas, or oil they may use to get your car up and running. You will also need to pay for any local tow truck used or extra assistance rendered by the Green Angels not included in their standard services. If you appreciate the service they provide, it's a nice gesture to offer a tip; though Green Angels may choose not to accept your money as the assistance is meant to be free.